Whether you&apos;re networking for a job or business (actually, what&apos;s the difference? ), you want to be memorable. Not memorable in any way, rather memorable in a positive way. 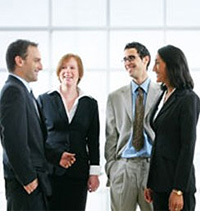 I&apos;ve been attending business networking groups for awhile and have also spoken at job search groups on various topics. While attending these events, I&apos;ve noticed 10 types of memorable networkers, some positive others negative. We&apos;ll start with the positive memorable types. 1. Eases into a discussion with comfortable small talk. The conversation may open with an intro like, "Hello, I noticed you just arrived. I&apos;m Trish. It&apos;s nice to meet you." This memorable person smiles and shakes your hand firmly yet gently. You feel no pressure talking with this person. 2. Introduces himself and follows with a simple question. "Hello. I&apos;m Steve. What brings you to this networking event?" This open ended question is nonthreatening. You announce it&apos;s your first time and you&apos;re here to see what this is all about. 3. Begins the conversation with a call to action, and you get the sense that you won&apos;t have to immediately deliver your elevator pitch. She approaches you with hand outstretched saying, "I&apos;m Trish. I&apos;m a motivational speaker." You ask what she speaks about, and eventually the conversation leads to what you do. 4. Is sincerely interested in hearing what you have to say. She&apos;s someone who actively listens, not just appears to hear you. "So you help people find jobs. What kinds of workshops do you lead? You also help your customers with their resumes? I&apos;m on LinkedIn but don&apos;t do much with it. How do you help people on LinkedIn? I could probably use your help." 5. She follows up. The conversation the night before led to the possibility of the motivational speaker visiting your organization to speak about maintaining a positive attitude in the job search. She calls you at lunch time to set up a date, like she said she would. The networkers who leave a negative impression are those who leave you thinking that maybe it was a mistake coming here. 1. Pounces on you like a lion. This type barely gives you time to respond. I remember when I was at a trade show and another public relations manager approached me, hand extended (weak handshake), and launched into his elevator speech, albeit a polished one. I was taken totally off guard. 2. The silent/talkative types. For an introvert, one of the most uncomfortable person with whom to speak is one who accepts your introduction and…that&apos;s about it. No substance behind her conversation. Pretty much no conversation. On the flip-side is the person who won&apos;t stop talking, despite your hints which includes backing away from him. 3. The distracted networker. Nothing bothers me more than the networker who&apos;s waiting for Prince Charming to come through the door. She&apos;s looking over your shoulder the whole time you&apos;re talking, while you&apos;re following proper etiquette by trying to engage her in conversation. 4. Arrogant networkers. Have you come across the one who gives the impression it&apos;s all about him? You&apos;ll know when you do because he as soon as he finds out you can&apos;t provide immediate help, he&apos;s out of there like a man on the run. Pffff. 5. Finally, there are tree killers. They&apos;re the ones who are handing out personal business cards like candy. Barely a word is said between you, but she hands over her card and asks for yours. It&apos;s definitely apparent that you can&apos;t be of mutual assistance, yet she wants to exchange cards. You remember her, because the next morning you regretfully toss her card in the trash. Networking should be a pleasant experience for all involved. It requires a conscious effort to practice proper etiquette so you contribute to that positive experience. Don&apos;t think only of yourself. Be a memorable networker in a positive way. What Should You Not Do At a Networking Event?